A barebone computer kit is a partially-built computer system which you complete by installing the remaining components. A barebone kit usually consists of a case, motherboard and power supply. You can browse a large variety of cheap barebone computers here. These kits from time to time will vary slightly but will have a few necessary compatible components. They are often referred to as Barebones or starter kits and will include a list of the supplied components. These kits are used as a starting point to build a new computer and can be found for both desktops and laptops. It is important when choosing the kit to carefully examine the different configurations to be able to choose the other components that are compatible to your CPU and motherboard. After adding the extra parts and an operating system, you will have a fully functioning PC. Own a customizable Mini PC kit with the power of a desktop PC. Choose your RAM, storage and operating system to build the PC you want. NUC7i3BNK has room for a lightning fast M.2 SSD and up to 32 GB of DDR4 RAM so you can increase performance easily. 7th Generation Intel Core i3-7100U. 2 x 260Pin SO-DIMM DDR4 2133. 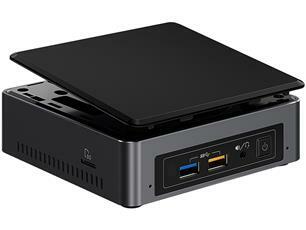 CLick here to view this Intel NUC Barebone system. Many times these kits can be extremely affordable saving you hundreds of dollars even after addition of the other parts. Caution should be exercised when purchasing these kits. It may seem simple for most beginners to build their own custom PC but even barebone installations can be difficult. Also, if a component is incompatible with your system or improperly installed, it can ruin your computer. Note: Many components used in barebones are usually refurbished or remanufactured. Ensure parts compatibility by carefully examining your particular kit and reading the motherboard owner's manual for detailed information. Build a Cheap Computer with a Barebone Kit! A barebone computer is a great choice for someone who wants to save money by building their own cheap computer but does not have the time and patience of starting from scratch. I am sure that whichever one you choose, you will be getting a fantastic deal on it. You will now have to make the decision as to whether you will start from scratch to build your own cheap computer or purchase a barebone computer. Click here to receive instructions regarding the installation of the other components to complete the building of your own cheap computer. Click here now and look at my BEST Online Cheap Computer Retailers' Guide. This guide allows you to visit a number of the BEST online Cheap Computer Retailers. Click here to view.